*Service must be Redeemed in the month purchased. Some exclusions apply. My bike works, but not as it should ☞ Tune-up time. We’ll perform precision tuning of shifting, brakes, and bearing adjustments(headset, bottom bracket, and hubs), light frame cleaning, wheel truing. February $39.99. That’s $45.00 Off! 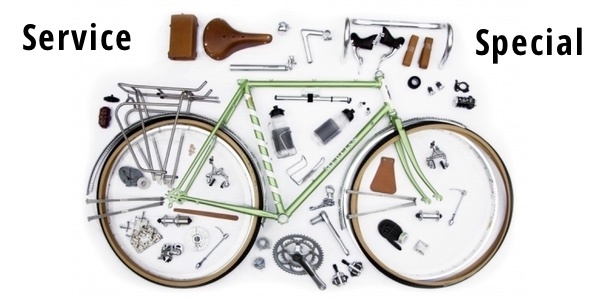 *Excludes replacement of: any cables or parts, stuck, stripped or seized bolts, derailleur hangers, spokes. Services that require extra time may incur additional cost. My bike is barely breathing and needs resuscitation ☞ Overhaul time. We’ll remove all components, clean & inspect the frame. We'll use our ultrasonic cleaner for derailleurs,, cranks, and brakes where applicable and then lubricate them for smooth action. Wheels are precision tuned for roundness and trueness. We then re-build your bike with new cables ($25.00 value) and FSA or Profile handlebar tape ($25.00 value). Come in or Call Today!